Twenty years ago Boris Yeltsin’s army and elected Russian parliamentarians clashed in Moscow, resulting in hundreds, even thousands, of casualties. Investigations now suggest the bloodbath was sparked by snipers, some of who were perched on the roof of the American embassy. The time: 7.00am, October 4, 1993. The place: Outside the Russian Parliament, Moscow. Russian Army tanks are approaching the White House, the new Parliament building. Inside the 18-storey marble building representatives of the regions and republics of the Russian Federation and its autonomous regions, along with their supporters, are holed up after a constitutional standoff with President Boris Yeltsin. Altogether there are nearly a thousand people inside the building on the banks of the Moskva River. Some of them are armed and prepared to die defending what they see as a Russian sanctuary where democracy has returned for the first time since 1917. Outside the White House thousands of supporters of the deputies have barricaded themselves. Interior Ministry troops and riot control police loyal to Yeltsin are arrayed on the other side. As dawn breaks over Moscow, Regiment 119 of the Russian Airborne Forces marches towards the White House. As they approach the building they come under indiscriminate fire. The Regiment Commander orders his troops not to return fire as he’s not sure which direction the bullets are coming from. Under fire the troops approach the walls of the White House. Five regiment soldiers are dead and 18 are wounded. 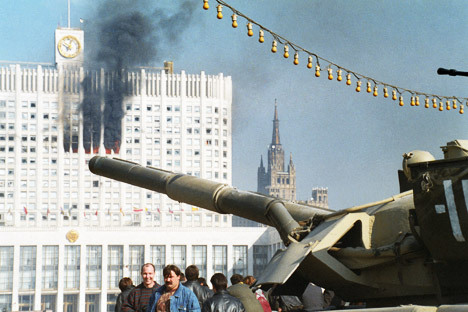 All hell breaks loose now as Yeltsin orders his tanks to fire at the White House. The deputies fire back with their Kalashnikovs but they are no match for the heavy tank rounds. Within a few hours, 187 people are dead and 437 wounded, according to official sources, while estimates from non-governmental sources put the death toll at as high as 2,000. It is the deadliest street fighting in Moscow’s history since the October Revolution of 1917. Back then the thinking was the hot-headed among the deputies started shooting at the military and then Yeltsin had no option left other than to order retaliatory fire. To ensure the safety of the thousands of Muscovites gathered in the area, the siege had to end at all costs. Russian author Nikolai Starikov begs to differ. In his book Rouble Nationalization – The Way to Russia's Freedom, he has exhaustively interviewed and quoted Russian military commanders on ground zero who told him the first shots did not come from the White House. In his book Yastreby Mira (Hawks of Peace) Rogozin mentions the exchange he had with General Sorokin. Rogozin: You said fire was coming from the rear, so the soldiers were shot in the back. Did you realise it after the fighting or during the course of it? If you had ordered to shoot back, why were these firing points not covered? What do you think of the shooters? Who were they? Sorokin: I ordered not to shoot in the direction of the American Embassy. Soldiers were moving in waves, so that while one group was moving, the other was covering it. I strongly prohibited shooting at the embassy, to prevent further questions. But even such provocation did not make the commander of the elite Alpha forces Gennady Zaytsev storm the White House. In fact, he disobeyed a direct order to storm the building issued by Yeltsin, who was by now hopping mad. Zaytsev backs up General Sorokin’s view: the shot that hit Sergeev “did not come from the White House, I am absolutely sure. This (was) a mean act aimed at making ‘Alpha’ members lose their temper and make them rush in and start smashing it all up”. Indeed, under the influence of the IMF, Goldman Sachs and other American advisors, Yeltsin wanted to throw the Russian economy under the bus. Even as Russian incomes halved, he wanted to privatise everything including the crown jewels of Russian industry. Yeltsin had a key motive to send Parliament packing – only the deputies stood before his IMF-backed plans to allow all state enterprises to die. Think about it – there would be no Sukhoi, MiG or Gazprom today. The way a democracy is supposed to work, when you are impeached by your own Parliament, you walk. Instead Yeltsin, propped up by his Western backers, used the most undemocratic means a president could think of – call in the army. Ironically, the vast powers that are now concentrated in the Kremlin, and about which the West carps so much are a legacy of Black October when Yeltsin usurped power, banned newspapers and clamped down on opposition parties. Strangely, the West applauded these acts. A backlash was inevitable. Fed up of his kowtowing to the West, Russians gave Yeltsin – and his era of humiliations – the boot. According to Starikov, unknown snipers acted in a similar fashion in Kyrgyzstan, Iran, Thailand and Romania, targeting women, children and youth, the segments of the population that government forces are least likely to fire at.